Throw the ball at the center of the net and it will bounce back to you at the same speed you threw it. 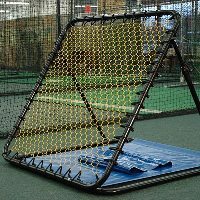 When you are ready to practice pitching, just flip the frame over to the Pro-Catcher side and use the pitching target. To assemble, follow the easy instructions provided. The Personal Trainer is perfect for use by teams, schools or just at home.